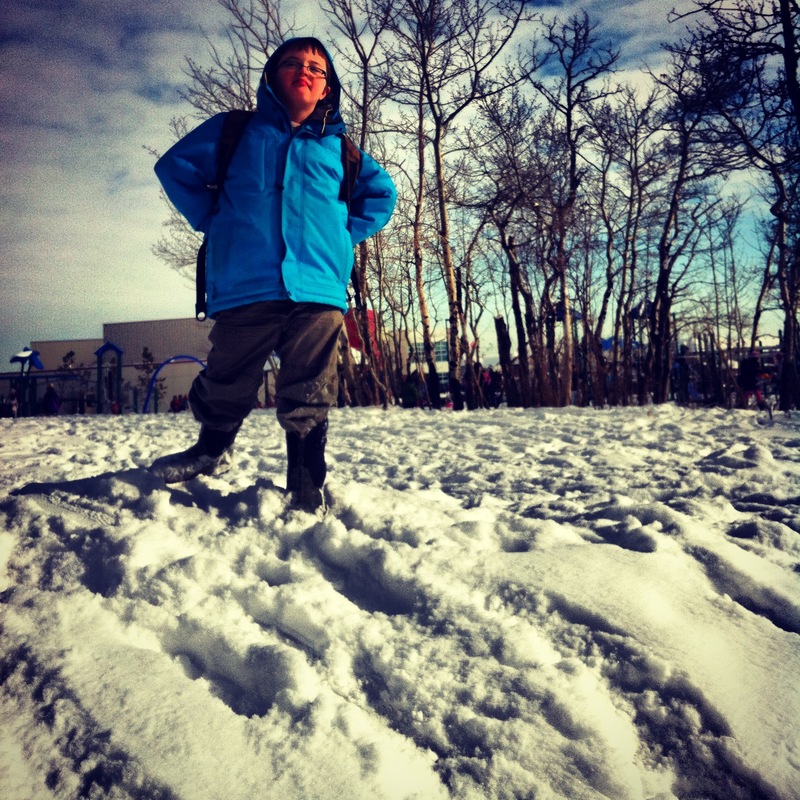 Last year, at the end of Grade 4, my youngest son said to me, “I do not want you to walk me to class anymore.” Well, he didn’t say that exactly. Rather, he communicated this sentiment through various behaviours in his own Aaron way. In the school hallway, Aaron started walking as quickly as he could to get away from me, head down, not waiting for me to catch up. He barrelled single-mindedly to class. He said, “go away Mom” and waved his hands dismissively at me. The inevitable separation from the mother had begun. Aaron happens to have Down syndrome. I hover and helicopter over him about 75% more than I did with my eldest two children, now 17 and 20, who are both fiercely independent and strong in character. With Aaron, things are different. I’m learning to mother again from scratch. In kindergarten, Aaron’s substitute teacher at his old school left him on a bench by the front door, and said, ‘wait here for me.’ Well, at age 5, Aaron didn’t wait for anybody, and he immediately vanished from the school. He was found by a mailman about 20 minutes later, across a busy city street. This traumatic incident imprinted on me for the next five years. I did not let that kid out of my sight until he literally started pushing me away in the hallway in Grade 4. You see, Grade 4 kids don’t have their moms walk them to class. “I’m 90% sure he won’t run away,” I tell the Assistant Principal. We concoct a complicated plan whereby Aaron’s Educational Assistant (EA) waited for us in the morning outside the staff room. She saw me in the school lobby, waved, and I handed Aaron off to her. No more mom walking him down the hall. Aaron quickly catches onto our transparent new scheme. He begins bolting down the hall, his face shielded from his EA by his backpack. Grade 4s don’t have their teachers walk with them down the hall either. I try to keep one step ahead of him. The adults switch to a texting strategy. I walk Aaron to school and text his EA when he’s at the school doorway. I text various messages: AW is in the building. The Eagle has Landed. She texts me back about 20 minutes later, he is here. We do this for about six months, into Grade 5. There are no incidents. He motors to class, opens his locker, unpacks his backpack, puts on his shoes and goes into his classroom. A few months in, after I say good-bye outside school, Aaron starts looking back at me suspiciously, to check if I’m texting. He’s onto me. The other day, I ran into the Assistant Principal. “From the school’s point of view, do you think it is safe for Aaron to walk all by himself, with no texting, like the other kids?” I ask. “Oh,” I say, feeling a bit silly. Hovering mom has been busted. The staff have been kindly humouring me all this time. Today I watched from the playground as my boy walked along the bike racks and disappeared into the school’s front door. “No love,” he said to me, which means no hugs, no kisses, no saying, ‘I love you’ as we say good-bye. It isn’t allowed anymore. This is how it should be. It is our job as parents to help our children feel secure enough that they can separate, Down syndrome or no Down syndrome. “Good bye, Aaron,” I call out. “Be awesome today.” Then I turn on my heel and slowly walk along the snowy path back home. this is our story. we all need to be loved.